Ha. So. Update 1! Update 2! Update 3! UPDATE 4! 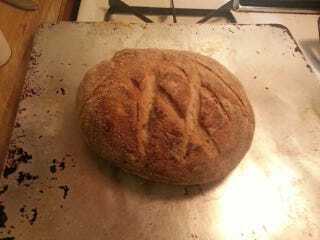 Emboldened by my feat of magic yesterday, I decided to make another loaf of bread. However, since the dough seemed too sticky to me, I added two cups of flour instead of 1 3/4ths cups flour, added a teeny bit more sugars, and a teeny bit more salt, keeping the yeast (of course, one packet) and the waters (3/4cup) the same. Now the dough is being incredibly slow to rise. Wot to do, O more experienced bakers of GT? Does I just give it a greater rising time? Because the bread IS indeed rising, just not as high and fast as it did yesterday. ETA: Uhhhh, so I couldn't resist messing with it, as when I took it out, there were holes in the top of the dough, instead of it being a smooth mass. So I kneaded in some sugar water and it is proofing again. I am a monster. ETA: ETA: ETA: The dough is being baked! In a boule, with steam. ETA: ETA: ETA: ETA: BAKED BREAD!